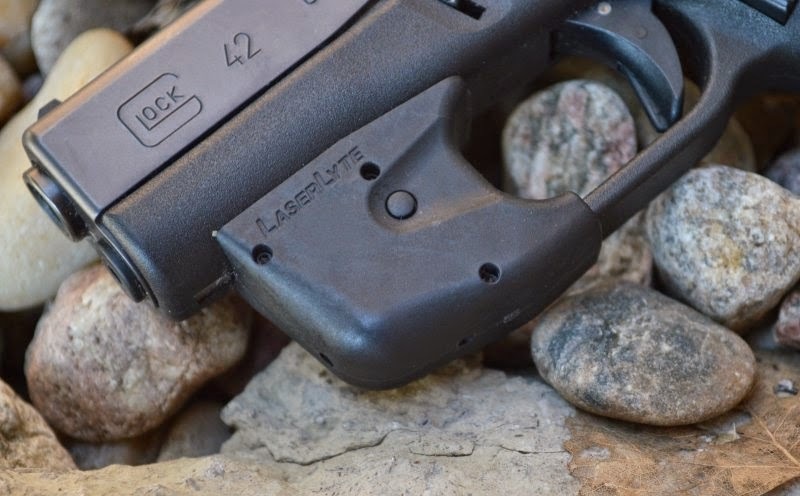 Now that the Glock 42 is one of the most popular pistols of 2014 and is literally flying off the shelves in record numbers, LaserLyte decided to offer a version of their extremely popular clamp on trigger guard laser sights for the Glock. 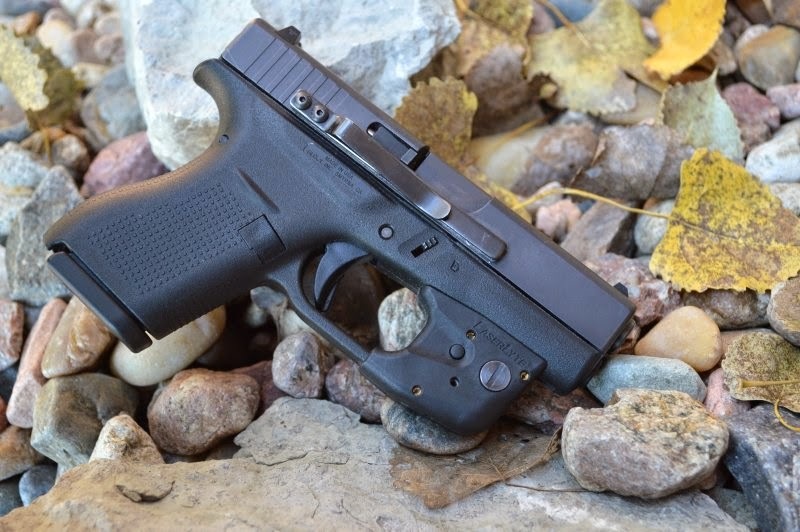 The LaserLyte TGL UTA-YY Glock 42 laser sight deserves pages of editorial to tell the arduous journey of how hard LaserLyte worked to introduce this sight and how difficult it was to create simple elegance in a user friendly interface. Well unfortunately for LaserLyte, people are more interested in the end result than the development process which due to non-disclosure agreements we cannot talk about anyway. That noted, the Glock 42 LaserLyte is gloriously simple and quality made from 55% Glass Filled Nylon and Aircraft Grade 6061 aluminum. 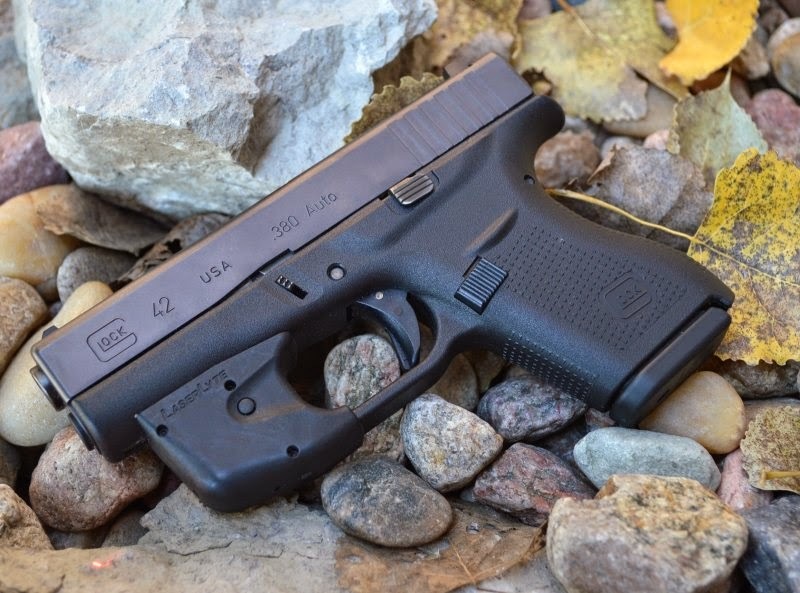 Installation is simple and only requires users to bolt the sight onto the front of the G42 trigger guard. Once locked onto the handguard there is no perceptible wiggle or movement and from my experience handles all the daily bumps and knocks without fulling out of zero. The owner of LaserLyte jokingly noted during an editors conference that the sight is FOPS operated - Finger Operated Pressure Switch. Jokes aside, FOPS is the perfect way to describe the operation of the LaserLyte Sight. The user basically clicks the sight on and off as needed via the ambidextrous buttons on each side of the sight - it really could not be more simple or reliable. The buttons are placed intelligently where your finger naturally rests when you finger is not on the trigger. It becomes a simple and natural ergonomic movement to touch either button to turn the laser sight on or off. Programing the LaserLyte laser sight can be done with just simple click and hold operations to cycle through either a "constant on" mode or a battery saving "pulse" mode. Run time will likely last users a year of use unless they train extensively with the laser. Runtimes are 5 hours with the constant on mode and 10 hours in pulse mode, however there is an auto-off function after 6 minutes. Most Glocks are sights are set to a 25-yard zero, however for the uses of this laser I choose a 10-yard zero. Keeping in mind that the laser beam is approximately 2” lower than the bore line, very close 2-5 yards shots will deliver bullet impact about 1”-2” above the laser dot. This is just something to train with to assure you know the differences of where the dot vs bullet impact will be and what decisions you might make on zeroing the LaserLyte TGl Glock 42 laser sight. I mounted the laser on I have seldom seen since my initial review which is the Glock 42. Mrs. Pandemic (the wife) very quickly absconded with the G42 as her every day carry gun. She love the size and functional similarity of the gun to her bigger G19 and G17 Glocks. One of the most amazing psychological aspects of laser sights are as an effective densive deterrent. In many cases situations where a person is required to use deadly force to defend themselves happens in seconds where drawing and firing seems to happen almost instantaneously. In other situations, the gun is draw and you are either investigating that bump in the night or have drawn and have the luxury of offering verbal commands. In these less later situations where a LaserLyte sight can be a huge psychological advantage for you and a defensive deterrent for attackers. You can see exactly where the bullet will hit and can concentrate on the dynamics of the situation instead of the sights and on the attacker side, no one wants to have a floating red dot on their chest which could easily be followed by a bullet. The unanimous verdict between the Mrs and I after testing was that the LaserLyte Glock 42 pistol laser is an awesome tool which is worth the investment to make the G42 even better. I just can’t wait until the release the G26 version hopefully later this year. The laser features ambidextrous activation, dual modes and auto-off. 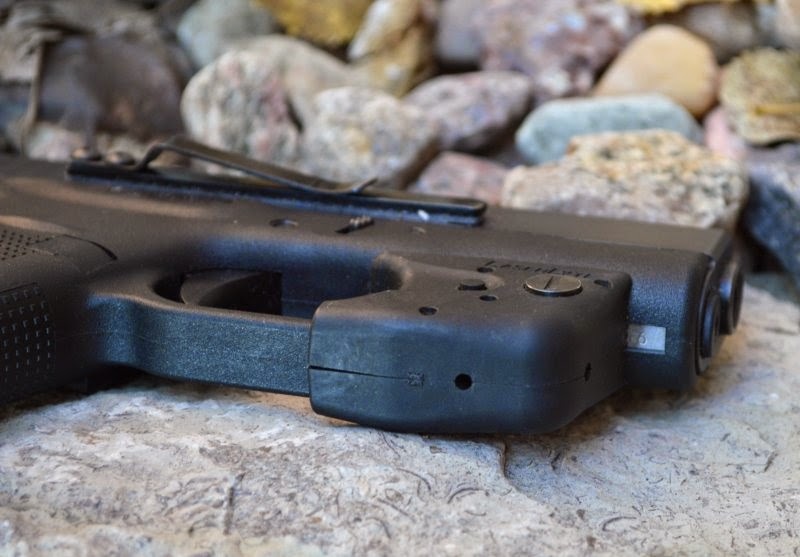 When the laser is mounted it matches the gun’s dust cover and trigger guard with perfect fit. Each TGL package comes with two housings per model and will fit two guns for the price of just one laser. Simply use a Philips head screw driver to remove the single screw to swap out the laser housings. A laser swap can easily be made in under a minute. Initial installation onto the gun will take less than five minutes and the laser does not require removal in order to change out batteries. Later this year an additional housing will be offered for the GLOCK®26/27 pistol. The housing (laser not included) will be available free of charge to anyone that purchased a UTA-YY when it starts shipping. Please keep checking the LaserLyte website for shipping details. I have a Glock 43. I hope you make a similar product that will fit it. Because if you do, I will definitely have to have one. I am very impressed with your products!